This has been a very hectic summer, but I still had time to see The Fashion World of Jean Paul Gaultier: From the Sidewalk to the Catwalk at the Montreal Museum of Fine Arts (MBAM). If you have had your eye on his work, either in films or worn by celebrities, then you will be thrilled to see so many of his creations in one place. What's more, his 140 ensembles are worn by sensor-activated animated mannequins. That's right. When you step in front, a face is projected onto the mannequin, and it blinks, winks, speaks, and in one instance, sings.My favourite was the male mannequin staring into a mirror and asking the video-cast reflection to disclose "the fairest of us all." 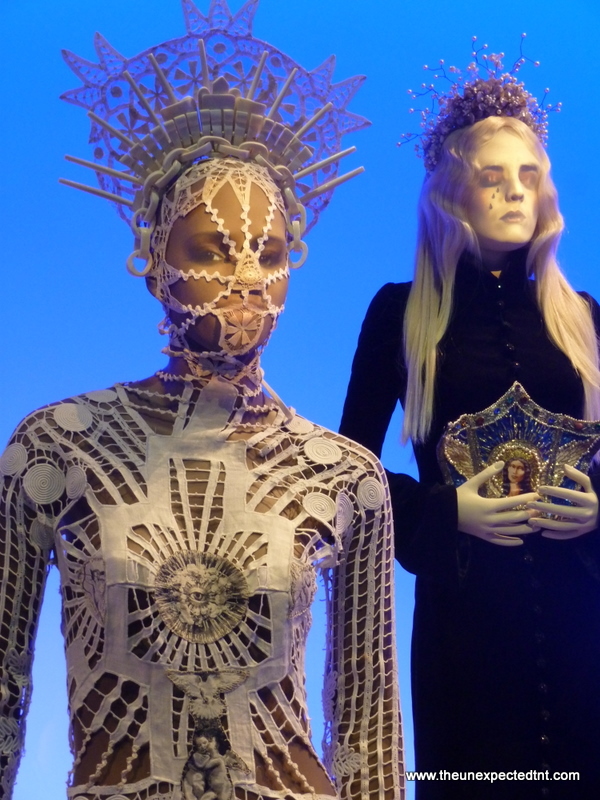 There was plenty of humour in this exhibition, which ends with the various films, the Fifth Element and a few from Almodovar, that have featured Jean-Paul Gaultier's work. Even if you aren't a fan of la marinière, you will still be abundantly impressed not only by his creativity but also by the sheer range of his work. Another positive note: cameras are permitted, but video is a no-no. Check out my slideshow below. : MBAM: Jean-Paul GaultierTweet this!